MISS LAILA, ARMED AND DANGEROUS by Manu Joseph is out on May 17 with Myriad in paperback and ebook as their lead novel for 2018. As Zoë Heller has said: ‘Manu Joseph's new novel is a daring, page-turning thriller, filled with anger and wit and some of the loveliest sentences you will read this year.’ For a tantalising taster, you can hear Manu read from the novel and talk about it (from Bangalore) with Mariella Frostrup on BBC Open Book here. On the day that Hindu nationalists and their controversial leader have won a spectacular election victory, a large apartment building collapses in Mumbai. The rescue operation finds a single survivor trapped under a beam. The only person able to reach him is Akhila Iyer, a medical student who is also a notorious social media prankster. Small enough to crawl along to administer medicine as rescuers try to dig him out, she finds him mumbling in delirium that two people are on their way to carry out a terror attack. Elsewhere, a young intelligence agent, Mukundan, is assigned to shadow the two terror suspects, one of whom is the teenage Laila, the sweetheart of her street. Time is running out. MISS LAILA, ARMED AND DANGEROUS is a gripping chase novel that poses searching questions about the workings of power and its effects on the ordinary people — the watchers and the followers, and those who are trapped when buildings fall. Mariella Frostrup speaks of the novel’s ‘searing prose’ and Ben East in the Observer called it ‘caustic, comic and determinedly controversial’, talking of ‘the thriller lurking beneath it’. HarperCollins India published in India in 2017 and Podium publish the Dutch edition. Manu Joseph will be in the UK for publicity later this year, and will also take up a writer’s residency in Amsterdam. Manu Joseph lives in Delhi and is a columnist for The Mint Lounge. He used to write the ‘Letter from India’ column for The International New York Times. His debut novel SERIOUS MEN (2010) won The Hindu Literary Prize and the PEN/Open Book Award, and was shortlisted for The Man Asian Literary Prize, the regional Commonwealth Prize and the PG Wodehouse Prize for the Best Comic Novel. His second novel THE ILLICIT HAPPINESS OF OTHER PEOPLE (2012) was shortlisted for the Hindu Prize and longlisted for the DSC Prize for South Asian Literature and IMPAC Dublin Prize for Literature. Both the novels have been translated into several languages. Manu Joseph’s second novel THE ILLICIT HAPPINESS OF OTHER PEOPLE has been shortlisted for the Hindu Prize, which he previously won in 2010 with his first novel SERIOUS PEOPLE. His new novel has also been longlisted for the 2014 IMPAC Dublin Literary award. The 2013 Hindu Prize shortlist consists of five books, featuring writers Sonora Jha, Amandeep Sandhu, Anees Salim and Manjul Bajaj, as well as Manu Joseph. The winner will be announced on 13 January, 2014, during The Hindu Lit for Life Festival in Chennai. The IMPAC Dublin longlist features writers Colm Tóibín, Hilary Mantel and Richard Ford. The shortlist will be announced on 9 April 2014, with the winner announced on 12 June 2014. There is a prize of €100,000 for the winning writer. THE ILLICIT HAPPINESS is also longlisted for the DSC Prize for South Asian literature. The shortlist will be announced at the London Schook of Economics on the 20th of November. Thereafter the final winner would be announced at the DSC Jaipur Literature Festival in Jan 2014. Set in Madras in the 1990s, where every adolescent male is preparing for the toughest exam in the world, THE ILLICIT HAPPINESS OF OTHER PEOPLE is a powerful and darkly comic story involving an alcoholic's probe into the minds of the sober, an adolescent cartoonist's dangerous interpretation of absolute truth, an inner circle of talented schizophrenics and the pure love of a 12-year-old boy for a beautiful girl. 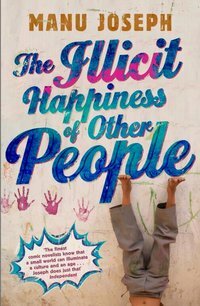 THE ILLICIT HAPPINESS OF OTHER PEOPLE is published by John Murray in the UK, Norton in the US and HarperCollins in Canada and India. Earlier this year it was a Top Ten bestseller in Holland, where Podium publish, and it has just been released as a lead title for C.H. Beck in Germany. Manu Joseph’s first novel, SERIOUS PEOPLE, won the Hindu Best Fiction award, and was shortlisted for various prizes including Man Asian Literary Prize and the Bollinger Everyman Wodehouse Prize. Later this month he will be in Belgium, with events including a public interview in Leuven on 26 November and a Reading Club in Passa Porta on 28 November. Manu Joseph’s second novel THE ILLICIT HAPPINESS OF OTHER PEOPLE has been Longlisted for the DSC Prize for South Asian Literature 2013. This $50,000 prize has previously been won by M Naqvi for Home Boy, by Shehan Karunatilaka for Chinaman: The Legend of Pradeep Mathew and by Jeet Thayil for Narcopolis. Others on the longlist include Joydeep Roy-Bhattacharya, Philip Hensher, Mohsin Hamid and Nadeem Aslam. The shortlist for the DSC Prize will be revealed on Wednesday, November 20, 2013 at The London School of Economics in London. The winner will be announced at the DSC Jaipur Literature Festival in January 2014. THE ILLICIT HAPPINESS OF OTHER PEOPLE is published by John Murray in the UK, Norton in the US and HarperCollins in Canada and India. Earlier this year it was a Top Ten bestseller in Holland, where Podium publish, and it has just been released as a lead title for C.H.Beck in Germany. Manu Joseph’s first novel, SERIOUS PEOPLE, won the Hindu Best Fiction award, and was shortlisted for various prizes including Man Asian Literary Prize and the Bollinger Everyman Wodehouse Prize. In November he will be in Belgium, with events including a Public interview in Leuven on 26 November and a Reading Club in Passa Porta on 28 November. Joining the ranks of fellow Blake Friedmann authors, Monique Roffey (THE WHITE WOMAN ON THE GREEN BICYCLE) and Christopher Nicholson (THE ELEPHANT KEEPER), Manu Joseph's second novel, THE ILLICIT HAPPINESS OF OTHER PEOPLE, has been shortlisted for the Encore Award, which has a prize of £10,000. His debut novel, SERIOUS MEN, is published in 14 languages, and is a bestseller in Holland, now in its 4th printing. With SERIOUS MEN winning The Hindu Best Fiction Award 2010, and being shortlisted for: the Man Asian Literary Prize 2010; the Commonwealth Prize South Asia & Europe Best First Book 2011; the Bollinger Everyman Wodehouse Prize 2011 and the the ALOA Award, Denmark, Manu Joseph looks to add another prize to his mantle with the ingeniously constructed, THE ILLICIT HAPPINESS OF OTHER PEOPLE. After the influential DWDD TV programme picked Manu Joseph's THE ILLICIT HAPPINESS OF OTHER PEOPLE as January's Book of the Month, the book has climbed steadily and has just entered the Dutch bestseller lists at Number 8, with more than 10,000 copies in print. Podium have just ordered their 4th printing since the book was launched in January. THE ILLICIT HAPPINESS OF OTHER PEOPLE is published in the UK by John Murray, the US by Norton, Canada and India by HarperCollins, and sold in France to Philippe Rey and in Germany to Beck, who will publish as a lead title this Autumn.